Green-edged pockets give an appearance of glass. 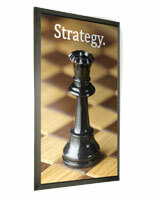 Double-sided poster area will help increase customer intrigue. 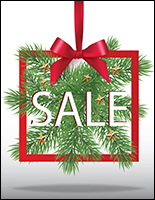 This indoor display, periodical stand is rust-resistant with its brushed aluminum base and side supports. The periodical stand also has a beautiful silver finish for additional allure. 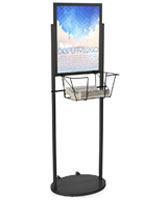 This periodical stand, also known as a publications rack, features a large, 24"w x 36"h poster area to help grab an audience's attention. With (2) green-edged acrylic pockets, the periodical stand makes viewing headlines an easy task for readers. 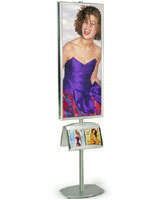 This periodical stand is a great display system for catalogs and other large format publications. The literature display, periodical stand would be perfect as both a fixture for retail and an organizational unit for an office or lounge. 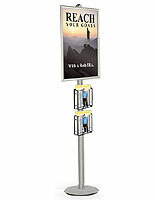 The literature fixture is also an adjustable periodical stand! 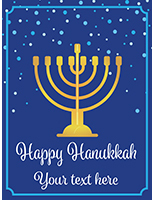 You can use the brackets to change the height and orientation of each acrylic pocket! The poster area is also double-sided! 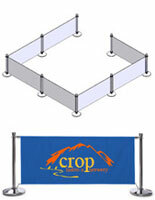 We provide the periodical stand with (2) clear, plastic lenses to protect your graphics and keep them in place. 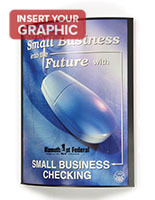 This periodical stand, such as our other literature systems, is a great tool for any store or facility looking for a better way to organize their literature.